Come along with Pentrex as we travel to the Northeast, exploring some lesser known railroads and railfanning locations. We'll see the Housatonic Railroad, operating over former New Haven tracks in Connecticut and Massachusetts. Next we'll take a trip on the Berkshire Scenic Railroad that shares the same tracks through the hills of western Massachusetts. Going trackside in Selkirk, New York we'll watch mainline operations into and out of CSX's giant classification yard. The diminutive Grafton and Upton Railroad, west of Boston, is a tiny shortline dating back to the 1800s that is now expanding. We'll chase their classic Geeps as they struggle with rollercoaster grades on their thrice-weekly turn. Then we'll climb to the summit of New Hampshire's Mount Washington aboard the "Railway to the Moon," the famous Mount Washington Cog Railway. Watch as our steam-powered train muscles its way up a grade that reaches 37 percent! Smaller railroads, classic motive power, and a few surprises! They're all here for you to enjoy in Pentrex's Northeast Sampler! Railfan East (New Hampshire) on 2012-12-23 14:00:34. Good show. It's nice to see Pentrex give some coverage to our state treasure, the "Cog", expecially now that its no longer all-steam. Nice job covering other railroads as well - can't speak to the complaints of the other poster, but worked for me, and of course DVD is far superior to anything on YouBoob. Gets my vote. Joe (Connecticut) on 2012-11-17 23:43:38. As a lifelong resident of Connecticut, I can assure Pentrex there is much more to offer in New England than what was covered in this DVD. The primary reason I bought this DVD was to see the Housatonic, and I was in for a surprise. Railfans familiar with the Housatonic might be pleased to see GP-7 7324 and GP-9 1802 in operation, but will recognize that this footage is six years old. That, combined with the fact that some of the footage is already available on Youtube (see Housatonic NX-12 by Superedit), leads me to the conclusion that Pentrex bought this footage and did not actually send out crews to record it. For that reason alone I feel cheated, not by Train Video Depot, but by Pentrex. I paid $19.99 for footage I could have watched for free on YouTube. There is also no coverage of Housatonic operations south of Canaan. The rest of the DVD is nothing spectacular. The same trains are seen repeatedly (meaning no variety) on the Berkshire Scenic, Grafton and Upton and the CSX coverage is limited to the same old locations covered in other productions from various producers; CP SK, Game Farm Road and an access road that parallels the entrance to Selkirk Yard. I want my money back. UPDATE: Pentrex assured me that the Housatonic footage was not purchased and that the video would be removed from YouTube. It has, giving the DVD some value for those who purchase it. I am standing by the rest of my review regarding the lack of variety and locations covered in the DVD. Dude, did you read the title? SAMPLER? Clearly you were expecting comprehensive coverage all over the map for your 20 bucks. Get real. As for me, I enjoyed the vintage footage of the Housy (with Geeps no longer on the railroad), the Cog (now decidedly less than all-steam) and the now-embargoed Berkshire Scenic. I can't imagine what you thought your twenty clams would buy you, but you're obviously hard to please. As for me - color me satisfied. cr6610 (New Hampshire) on 2012-11-15 14:38:20. Glory be! Welcome back to the Northeast, mighty Pentrex! And this show is well worth waiting for. Great coverage of the Housy, the Berkshire Scenic (before the Housy tossed them off their tracks), some CSX action at Selkirk, a small railroad I'd never heard of, the Grafton and Upton, and the showstopper - the Mt. Washington Cog - in it's full-steam glory. Very good videography and pacing, a welcome addition to the catalog after several years of SoCal monotony! Welcome back to the Northeast, Pentrex - I hope you'll stay awhile. Steamboy (Revere MA US) on 2019-03-02 15:45:23. 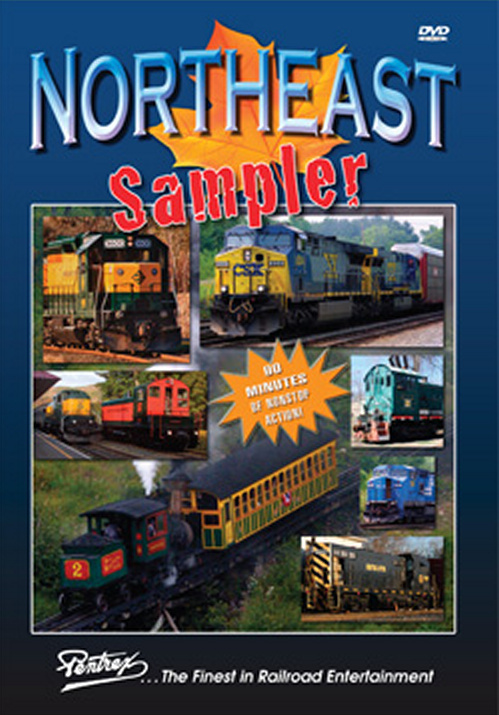 In this 2012 program, there is an incredible mix of mostly diesel powered freight trains in New England mostly in Connecticut and Massachusetts, CSX in selkirk New York, and steam on the Cog In Mt. Washington. Beginning in Canaan Connecticut, there is some switching to be done in the fog at the Housatonic railroad. Power for the first train is Former Conrail GP35 #3602 and GP7 #7324 that was originally made for the New York Central. The first 2 diesels are in the colors that are reminiscent to the Chicago and Northwestern railroad. GP9 Number 1802 is still wearing the black and red colors of the providence and Worcester. This railroad usually ran 6 times a week to exchange with CSX in Pittsfield Massachusetts. Note the 2 bottles of oil on the steps of 3602. Next, the freight heads backwards while turning on the Wye. Note the 2 cabooses. Another caboose is on display, this time it is next to the Connecticut union station which is still undergoing restoration after a fire damage. As the freight crosses route 44, note that Brooks pharmacy makes a cameo appearance in the background. After picking up more covered hoppers, it crosses route 7. The fog is still thickening, as the freight blares it horn, crosses the bridge and into western Massachusetts. At great barrington, the fog is starting to burn off. In lee Massachusetts on a different day, the providence and Worcester GP9 leads a mixed freight with 7324 trailing. At Lenoxdale, the Geeps pass by a river as it crosses the bridge. Note the covered gondolas carrying debris from demolished buildings, that have an unusual NYC from Conrail�s break up. Next it is time to go back to Great Barrington, as 3602 takes the lead. Note the leaves falling from the trees. Spanning the housatonic River, the freight crosses the bridge. Still under slow orders, the train is at Stockbridge Massachusetts. New England�s fall colors look beautiful as the train enters Lee, with an almost perfect reflection shot. Next, the freight passes through the Berkshire scenic Railway museum in Lenox. Afterwards, it is seen at milepost 82 on the wobbly rails as it continues north to Pittsfield. On another day, 1802 and 7324 is back at milepost 82. All of the geeps on this Western New England shortline have since been sold. Moving onto the Berkshire scenic railway museum in Lenox, it operates on the same tracks as the housatonic to Stockbridge. This 4 coach train is operated by former New York Central/Conrail SW8 number 8619. Here it leaves Lenox, passes under the camera crew at milepost 74, cuts to the going away shot from the bridge, and arrives at Stockbridge. The Stockbridge station used to receive passengers in the new haven days. Note that one of the coaches came from the Holyoke heritage park railroad. 8619 uncouples the coaches, and would have to runaround the train back to Lenox. This would give passengers the time to see the diesel in action from the depot. After coupling to the other end of the train, note that one of the coaches is numbered 328, which is a reference to the northern pacific steam locomotive. With everyone back on board, 8619 heads back to Lenox. Moving west to the border of Selkirk New York, a visit to one Of CSX�s Biggest classification Yards is included. First a since sold to Pan Am Rail Standard Cab C40-8 number 7534 is on an auto rack train idling the tracks with HLCX 6074 trailing, while a 2 unit with a cabless slug, switches back and forth. Next a mixed manifest enters the yard from the west. SD50 number 8665 got a new upgraded paint, while Conrail 8666 is trailing behind. With the green signal activated, the auto rack leaves the yard. Relocated to the east throat of the yard known as SK interlocking. In the days before the September 11th 2001 attacks, all people could set up there without anybody raising an eyebrow. An eastbound mixed SEBO-Selkirk to Boston (since been gone in 2013 due to the beacon park yard abandoned) rolls out of Selkirk, as the Conrail unit is sandwiched between the CSX units. Since the now gone beacon park yard in Boston�s west side, all main trains go as far as Worcester for intermodals, and to Framingham for the mixed cars. The Hudson River line autorack turns west, after climbing out of New Jersey and along the Hudson River near the bear mountain area. While the CSX freight is at a red signal, Conrail 2726 runs light and heads backwards to a worksite. The reason why the CSX Boston line freight is at a red signal, is because it must wait for Conrail 3188 as it arrives from the port of Albany branch. This Dash 7 was originally built for the Western pacific as a Uboat. With 3188 out of the way, the CSX Boston train with a Conrail unit enters The Selkirk Yard limits. Since the 9-11-01 attacks, all photos of the Selkirk trains are allowed only on the route 9 bridge, as a doublestack makes a bend and switches tracks at the junction several years later, going at medium speed. In the background, another freight is rolling backwards. Next a look at the yard is shown, which features C40-8 7546 in it. Followed by a 3 unit manifest off the Boston subdivision. Sadly 7546 have since been scrapped. A Union Pacific unit is also idling at the yard. The same doublestack train got a crew change and leaves the yard heading west. Leaving the biggest CSX yard behind, a 2 coach geometry train is heading west. Next a 4 unit manifest comes into view with a Union Pacific unit in it. Afterwards, a 5 unit mix train with a C40-8 inside races by the first train in the same direction. Moments later, a westbound 2 unit autorack is shown. Keep your eyes open for the red and green signals activated in the background. Back in New England, the Grafton and Upton railroad is shown with a look at the yard, Chopped nosed GP9R number 1751 is activating its own generators. GP9 1750 from the bay colony railroad, is also awakened. Also in the roster is CF-7 1500. With the derailer removed, the 2 diesels begin switching cars. After picking up 4 tank cars, it has to stop at one of the many unprotected crossings. Some stills of the scrapped alco S4 number 212 is included. Another unprotected crossing is shown, as automobiles must come to obey the red flag. The G&U itself had a ton of uphill and downhill tracks. Arriving at West Upton, the freight must come to a crossing as it is descending the hill. Both 1750 and 1751 are shuffling cars in the yard. A track inspection vehicle is included as the 2 diesels back up and switches tracks. Returning light, the 2 diesels must take 2 tankers back to The CSX connection at Grafton. The uphill train is underway but with 1750 leading long hood forward. Next it tiptoes through Grafton center on the way back. North of the Washington mill, one last runby is shown as we bid farewell to the interesting Massachusetts freight railroad. The final stop in the program is a visit to Brenton woods. The majority of this program is mostly diesel powered freights. But at the mount Washington Cog railway, there is a ton of steam action which was recorded before all trains are taken over by eco friendly diesels. From the base of the station, engine number 6 named kancamagus leaves the coal area and couples up to its coach. Pentrex first visited this railroad in 1994 or 1995 for their great American train rides volume 3 video. But when they return to New England in 2007, the countdown to the final runs of all steam action is nearly coming to a start. Number 4 the moosilauke, has finished coaling up and waits behind number 6. It�s departure time as number 6 leaves Brenton woods. Old peppersass is sitting on display. Number 4 is on the move with coach 2 the mt Washington. Note that the engine is using number 8�s tender. The 2 engines are digging into the grade. Sending a nice plume Of Cog smog. Some onboard footage is included. The locations and marks on the climb to the summit, includes the skyline switch at Waumbek tank. Higher up the line, switches are strictly manual and look more like an unsolved puzzle. At 4500 ft it passes by the halfway house which was painted in gray. Back in the 90s it was painted red. A spectacular view of the white mountains are shown as the train passes Jacob�s ladder. From a rocky level ground shot, number 10-the KroFlite whistles by the camera as it approaches the summit. On an extremely rare clear Day, the scenery looks spectacular. Fast forward to 4 years later in 2011, almost every train on the Cog have since been dieselized. On an afternoon, a trip chartered by the Massachusetts bay railroad enthusiasts is operated with engine 9 waumbek. First the locomotive takes on coal. Then the diesel leaves Brenton woods. Riding footage is included as the weather is turning for the worst. Big Harry (Dover, Pa.) on 2013-04-23 06:07:52. Too much time devoted to following a single train. Could have put in more of the different aspects of each railroad.